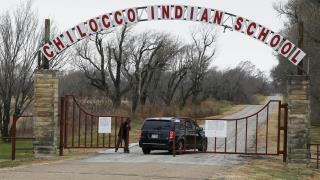 (Newser) – Five Native American tribes that own an Oklahoma site where the US Department of Homeland Security intends to conduct bioterrorism drills next year now oppose the government's plan, saying the agency didn't inform them about chemicals it plans to release on grounds the tribes consider sacred because more than 100 children are buried there, the AP reports. The Council of Confederated Chilocco Tribes is made up of five tribes that jointly own what's left of the former Chilocco Indian Agricultural School where the testing would be conducted. The Chilocco school was one of several federally run boarding schools where the US sought to assimilate Native American children. The tribes say the federal agency is failing to protect a site with religious and cultural significance. "Often when a child died at the school, the family didn't have the money to bring the body home, so they were buried at the school cemetery," said a spokesperson for the Otoe-Missouria Tribe. Many of the graves are unmarked, she said. Homeland Security is leasing the site to conduct drills that it says will help it determine how authorities can best clean up after a bioterror attack and how much chemicals might penetrate buildings. But the tribal council issued a statement this past week opposing the testing. The tribes say the substances the government plans to release are "potentially dangerous," though Homeland Security has insisted they're harmless. The other tribes that are part of the council are the Kaw Nation, Pawnee Nation, Ponca Tribe, and Tonkawa Tribe. Why can't they conduct these drills on military bases or in the boondocks of the AZ desert or somewhere, far away from the gen pop? Makes no sense. I recommend using the publicly owned property at 1600 Pennsylvania Avenue NW Washington, DC. It's widely reported that the current tenant is frequently AWOL playing golf and is rarely in residence... He'll never know.